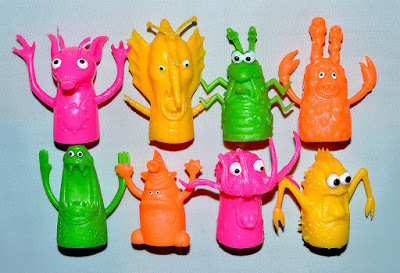 Someone, somewhere once thought it would be a good idea to make jiggly rubber monsters for kids to stick on their fingers, leading to decades of all different varieties of these little weirdos being doled out as cheapo prizes in places like arcades, fun fairs and dentists offices. 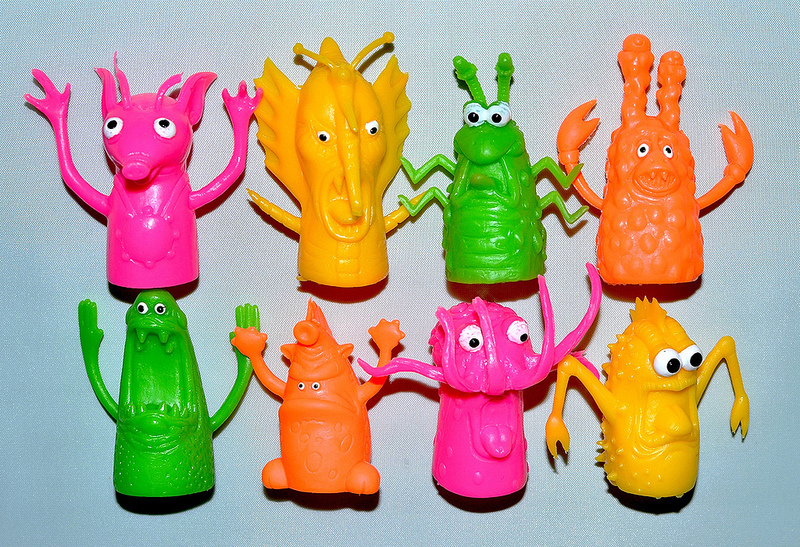 Some of them are simple and some of them look like creatures out of crazy nightmares, but all of them are fun! 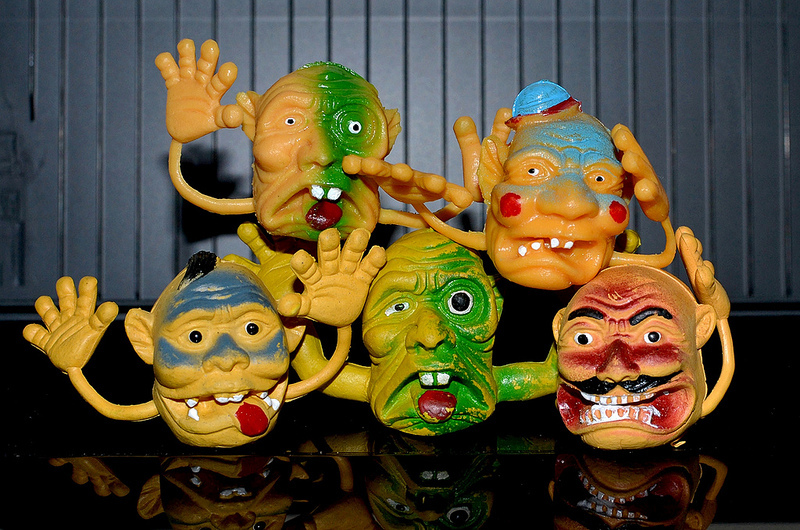 Below, we'll take a look at different kinds of monster finger puppets over the years. 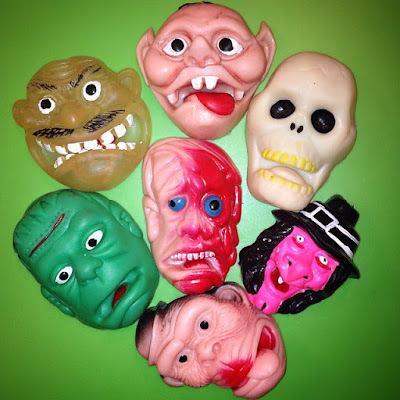 Since I already featured Russ brand finger puppets in a different post they won't be included in this one, but you can check those out here. 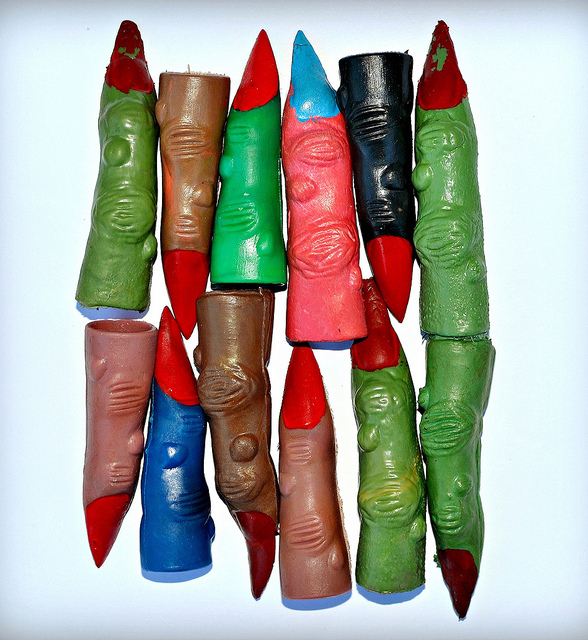 These guys are the simplest, most old school monster finger puppets. They usually have googly eyes, gaping mouths, flailing arms and are made of soft, jiggler-style rubber. Sometimes they're translucent and sometimes they're solid, but they almost always have sloppy paint details. 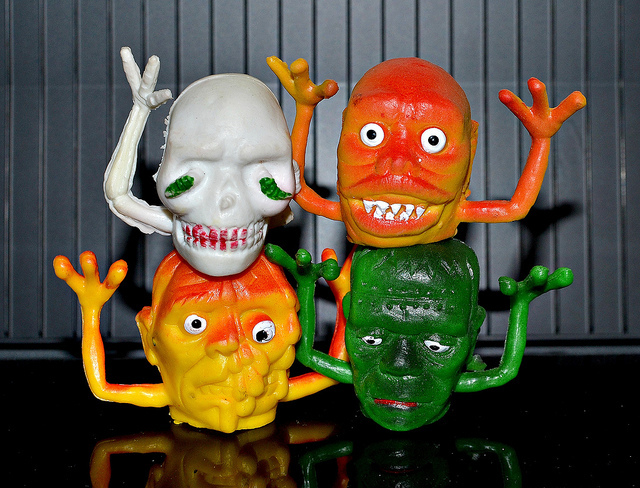 These weirdos have been around for decades, and versions of them are still being sold today as party favors and the like! 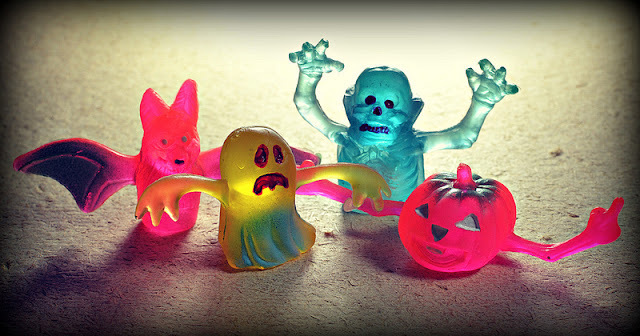 Here's some creepers you can stick on your fingers to celebrate the 31st of October. I'm not sure when exactly these molds originated, but they've been around for many-a-Halloween. 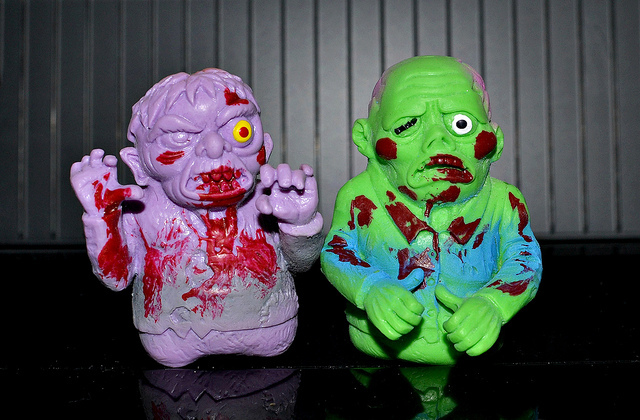 In fact, I've seen versions of them available as recently as this year. As you can see below there were clear colored versions produced at some point too, but they don't pop up as frequently. They're probably bootlegs of the originals. This is a different variety of finger puppet that are just big heads you stick your fingers into to make them look like they're talking. 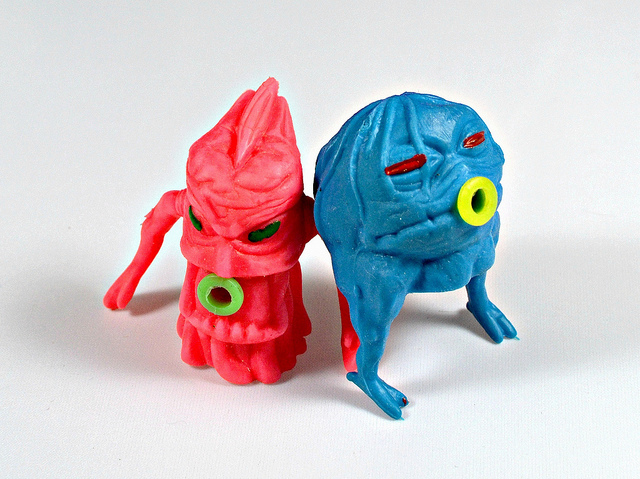 These turned up all the time in the '80s and '90s (and maybe even before that), but versions of some molds are still being produced today too. How awesome is that face-melting dude? Here's a bunch more that don't fit into the above categories. 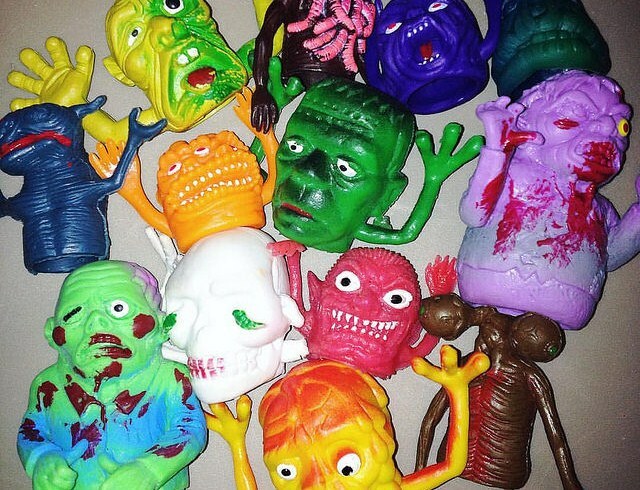 Lots of cheap, freaky goodness. These are awesomely grotesque. From the '90s I think. And there you go -- a bunch of dastardly degenerates for your digits. 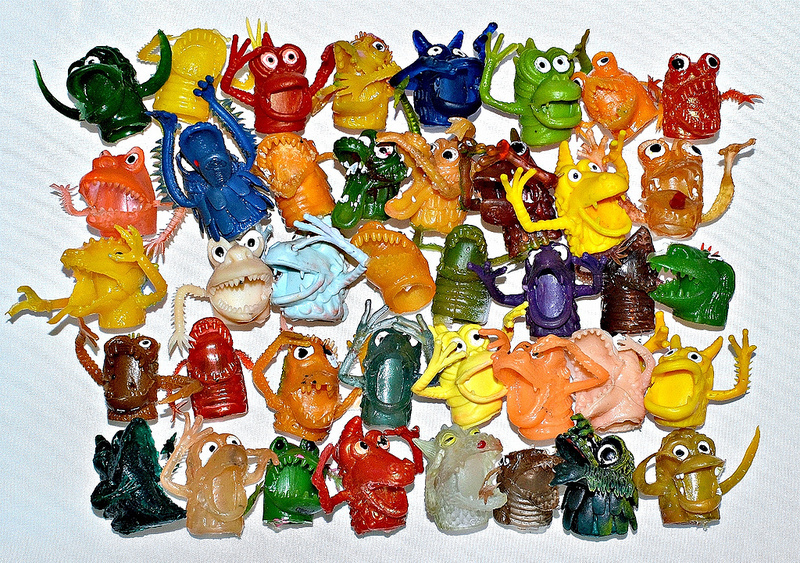 It's pretty amazing how many monster finger puppets have been produced over the years. The ones shown here is probably just scratching the surface. What about you? Do you remember collecting any of these or have any types not shown in this post? I've had loads of those monster face things over the years, never had them down as being "related" to classic finger monsters until now - seems so obvious! Indeed it does - interesting! Just speculating but the 2 monsters you say may have had sticky tongues, might they have had a tongue like those blow out party favors? 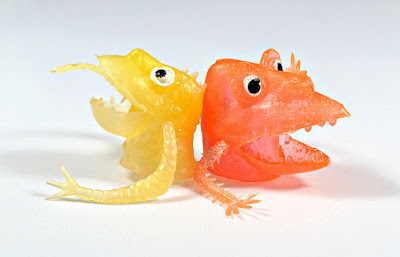 Like when you squeeze the monster it would displace the air and make the "tongue" stick out? 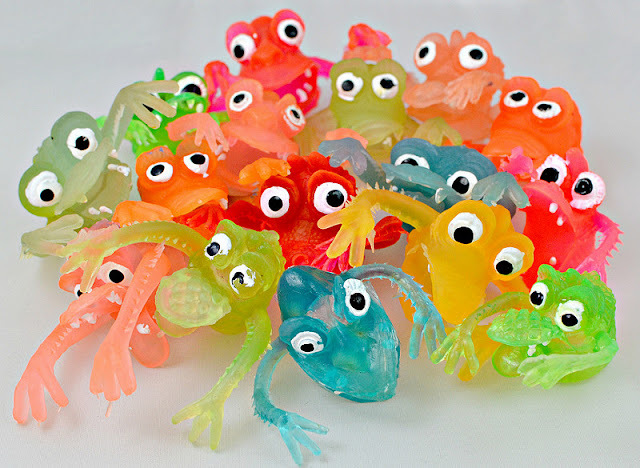 It's possible, but from what little memory I have of them when I first got them, they were like the material of those sticky hands.